Whenever a black person diverges from the path of respectability and voices an opinion contrary to the mainstream narrative, the keepers of the status quo will quickly shout them down with the same, recognizable refrain. Sometimes it sounds so familiar, one might think the people who sit atop America’s totem pole must have trained one another in how to regurgitate the same lie. Apparently, the first course in the school for White Young People of Influence, Privilege and Opportunity (W.Y.P.I.P.O University, founded by Dwight Mann) is “Twisting History 101.” The freshman-level class teaches its fair-haired students how to distort any argument raised by a person of color questioning white supremacy. Upon completion, students are equipped with the methodology to deftly dodge anyone who dares to challenge their privilege and white entitlement. Wypipo love Martin Luther King Jr. Since his death, they have managed to whitewash his legacy and transform him from a revolutionary willing to bleed and die for what he believed in, to a meek, milquetoast orator who fits their narrative of the sweet, submissive hero who begged them for a seat at the table. The list goes on. We have neither the time nor the bandwidth to catalog the times people of privilege have used MLK’s name to twist black resistance into pacification. You should just know these people are liars. They are cockamamy con men. The people who ask the question of what would MLK have wanted will put you in a choke hold and try to convince you it is a hug. 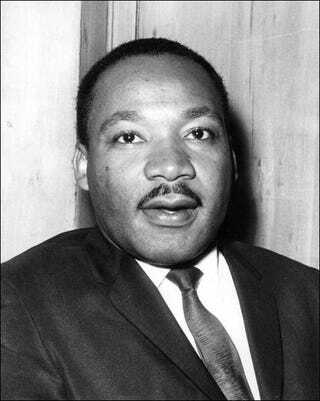 Whenever they bring up Martin Luther King Jr., you should first remind them to keep his name out of their mouth. Then, tell them Martin Luther King Jr. consulted with the Student Nonviolent Coordinating Committee, the Southern Christian Leadership Conference and with black activists and leaders across the country, but you don’t remember any accounts of him taking any orders from white people—even the president. Remind them that every time someone tried to keep Martin quiet, he yelled louder. Ask them if they heard about the summer King and Rosa Parks crippled an entire city’s transportation system by boycotting. Ask them if they ever read about the time policemen, Klansmen and mean white men with sticks and chains bloodied marchers on the Edmund Pettus Bridge and King said, “Next Sunday, I’m marching with you.” Ask them how the hell they think they’d still be talking about him 50 years after his death if he didn’t upset an apple cart or two. When you run into a graduate of WYPIPO U, do not fall for their freshman-level tricks. They want to convince you to be docile and timid, like their fictional historical painting of Dr. King. When they ask you what Martin would have wanted, they are ostensibly trying to shame you into submission. Never forget that the only reason your people have gotten this far was because we didn’t listen to them. Explain that Martin said the only people worse than the White Citizens Council and the KKK were the white moderates who say, “I agree with you in the goal you seek, but I cannot agree with your methods of direct action.” Remind them that the alt-right white supremacists who made a petulant, Cheetos-colored blowhard the leader of the free world are the ideological direct descendants of the people who put a bullet into King’s brain on the balcony of that Memphis, Tenn., hotel. If they really want to know what Martin Luther King Jr. would have wanted, tell them you actually have an answer.